The 18-year-old Piyush Varsha bagged Miss Bihar 2015 title in the beauty pageant that was held at Sri Krishna Memorial Hall in Patna on Monday evening.Tanushree became the first runner up of the contest while Aarohi Shrivastava named as the second runner up. Piyush is currently pursuing dentistry from Saraswati Dental College in Lucknow. Overwhelmed by the victory she said that Bihar has immense talent but girls here do not come forward to show case it. She further said that modelling is not a bad career, but for that girls need to explore themselves. This is the time when guardians should change their mindset and allow their daughters to prove themselves, she added. 1st Runner up Tanushree is a class 12th student of Delhi Public School in Patna, who aims to become a fashion designer in future and Aarohi has passed Class 12th. Briefing about the event one of the organiser informed that 150 participants were selected from different districts of Bihar for this competition, out of which 20 entered into the grand finale, which had five rounds. In the first round, the participants danced to the tunes of Bollywood numbers and in the second round they introduced themselves. In third stage, participants went through a club round while in the fourth round their IQ was tested. Winners were announced after the fifth round that was judges round in which they replied to the questions asked by jury members. 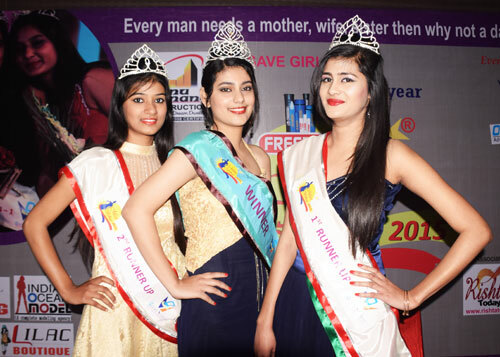 Later, the winners were crowned by former Miss Bihar Shalu. The jury members included Bhojpuri actor Pankaj Kesari, model turned actress Zoya Afroz, Mumbai-based businessman Suresh Thomas and Shivani Diwala. If sponsors of the event are to be believed, then Piyush has already started getting several modelling contracts.